We’ve been building SharePoint sites for almost a decade. Throughout that time, we’ve had a lot of ups and downs – moments of pure jubilation & occasional fits of rage and bewilderment. It’s safe to say that we have always been encouraged at Microsoft’s commitment to product innovation and its ability to roll out new product features. With that said, the last 18 months have been most exciting. We’ve seen a major leap forward in making the service fit quite nicely into the modern computing experience for employees. Elements such as document storage and anywhere access (including mobile device), communication and collaboration features, and a framework to build applications and workflows that automate business processes – SharePoint online is truly an essential component of a modern office. With its current features, navigating through Sites (portals) enhances engagement & making it easy to get things done. But how can we make Sites more appealing to groups that require different needs for pages and site navigation? This coming spring, SharePoint adds the long-awaited setting called, Megamenu & Site Layout Navigation. This “look and feel update” gives users what they asked for – and it’s about to make a big impact in the way we collaborate. Site owners can use Megamenus to showcase their site’s navigation items, update their “change the look” options to combine all modern site layout/feel options. Additions like Site Headers now allow adjustments on logo and background choices. As well as Site Footers, which allows an organization’s logo, text or links to be added on bottom pages. 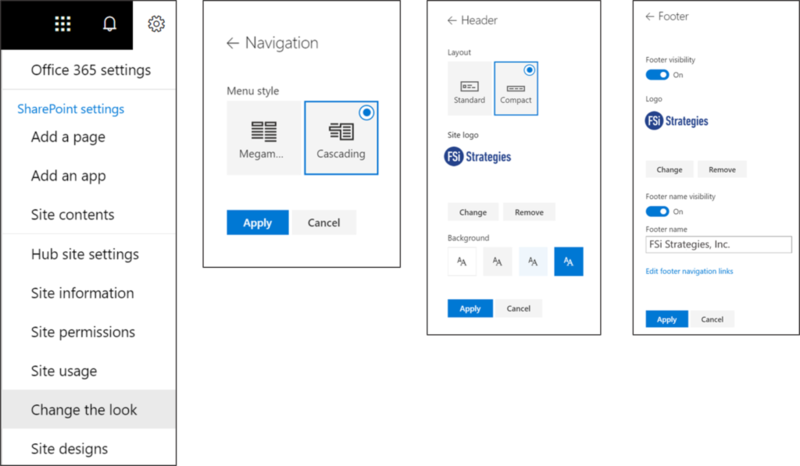 You can make these change options within Site Designs under Site Settings this March – available for Office 365 customers on Standard release and GCC thereafter. Our Cloud-Connected IT leverages SharePoint as well as Microsoft Cloud to create a complete, intelligent, & secure solution to empower employees. From Microsoft 365 to Azure, FSi Strategies helps develop solutions that embrace the new culture of the modern workplace. Ask us about how our Managed IT Services and Enterprise Cloud solutions can help your organization migrate, store, & secure your data for intelligent collaboration.